Purpose: Avaz for Autism is an Augmentative and Alternative Communication (AAC) app available for the iPad and Android tablets. Many components to Avaz for Autism are similiar to other AAC applications and independent devices. The app allows for full customization of all the below features. Core Words – These are frequently occurring words that are used in all situations, contexts, and environments. Avaz includes 10,000 SymbolStixs symbols with the ability to add any image from the photo library. I like that when a picture is added to an Avaz button, it can be deleted from the Photo Gallery on the iPad but will still appear in the app. Organization – The app comes preprogrammed with Quick words, Core Words, Getting Started, Basic, and Advanced categories for messages. The preloaded organization leaves much to be desired; however, this can be a good thing for an SLP. Each child is unique, so whether the organization will be pragmatically or contextually organized, Avaz is a blank page just waiting to be filled in with a bank of vocabulary and images. Field of Choices – The “pictures per screen” option offers fields of 1 up to 24. This does not limit the number of buttons per page, rather it limits the number of cells per screen; scrolling down reveals all buttons per page. Voice Record – When creating or editing a message button, the user or user’s family member can add his or her voice so that when selected, it plays the recording. Alert – In the bottom, right hand corner of the navigation panel is a button labeled “Alert” with a bell as an icon. When selected, a chime like an elevator button plays. To me, it amounts to a tap on the shoulder or a pointed finger when trying to gain attention. Mistake – Above the Alert button is a button labeled Mistake. When touched, it says “I made a mistake”. With other devices, you can create the button; yet Avaz just knew there are people out there making ‘mistakes’, like many natural, unaided communicative attempts. Quick/Core Words Button – In the middle of the navigation panel lies the Core Words or Quick Words icon. No matter what page you are on, this button takes you to either page. Share on Social Media – This is such a fun feature that I would gladly integrate in therapy. After programming messages, users can email parents messages from a session, Facebook a family member, or Tweet their favorite vocabulary word from a session. Of course, this setting can be turned off when unwanted. Track Data – This is just a slick feature. Turn on Avaz tracking, use the app, stop tracking, and it will e-mail you a list of the date, time, type of selection (message vs. navigation vs. action), and what message button was selected (see picture below). This can be helpful for seeing the type of messages accessed at home, after therapy to judge carryover and generalization of goals. Users: As an SLP, if I offer a client and their family the option to use the app for AAC, the only way I can program it is if I keep their device for a few days. This isn’t user friendly for making changes to the organization. Also, what if they forget the iPad for therapy? Really needs the option for multiple users. Deleting: You have to delete buttons one at a time. This is time consuming if there are 10 + buttons to delete. Hiding Messages: Currently, you can disable a button to turn off the action/voice. I would like the option to hide it as well for those who need less visual distractions, but are working toward using the button. Text-only Option: Currently, a new message button cannot be created without an image. If I want a message that has the word “Go” as the image, I have to take a picture of the word. Navigation Panel: There needs to be a way to enable/disable the navigation panel buttons. Otherwise, users can continue to hit these with no way for communication partners to hide them. Switch Access: There isn’t a way to turn on page scanning for those AAC users accessing via switches. My new internship at a private practice specializing in AAC has offered me valuable insight into the AAC world. While my time there has been short, I’ve seen users on Dynavox devices, Saltillo, and iPad users. The iPad offers inexpensive access to communication devices that might be otherwise inaccessible due to lack of insurance coverage and cost of devices. 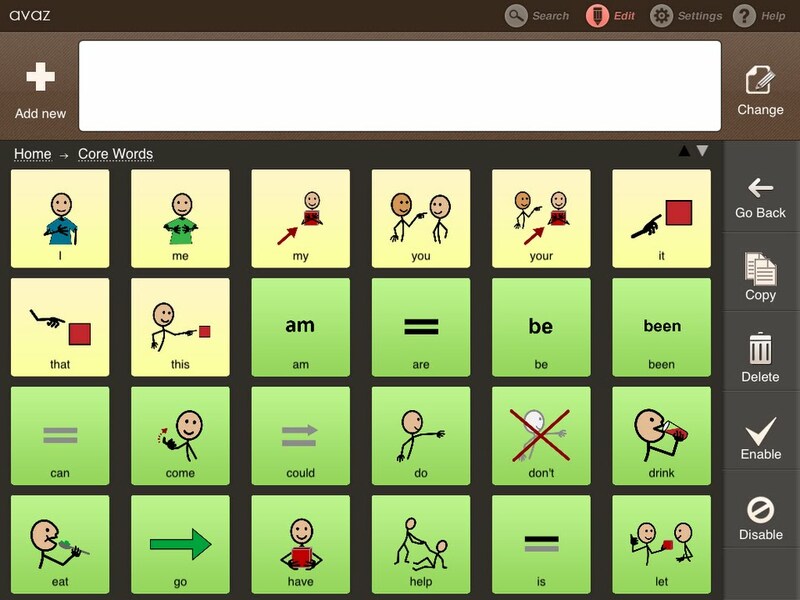 I think Avaz for Autism offers a well-priced AAC application, that when utilized and programmed by a Speech-Language Pathologist, expands the communicative world for those with communication impairments. While I did make several suggestions, none of them limit the use of the app; but they might make it easier for SLPs to program and customize the app for every unique client. Combined with a team-approach assessment and intervention program that utilizes input from family, teachers, and therapists, Avaz for Autism is a tool that can promote expression and meaningful communication interactions. Every child has different communication needs, a Speech-Language Pathologist should always be an integral part in deciding which AAC application or device to purchase. Nunes, D. R. (2008). AAC interventions for Autism: A research summary. [Full Text] International Journal of Special Education, 23 (2), 17-26. Fifty-six studies from 1980 to 2007 involving the use of augmentative & alternative communication (AAC) by individuals with autism were reviewed. Lauren Enders, M.A., CCC-SLP, a professional AAC consultant, wrote a very helpful app review.